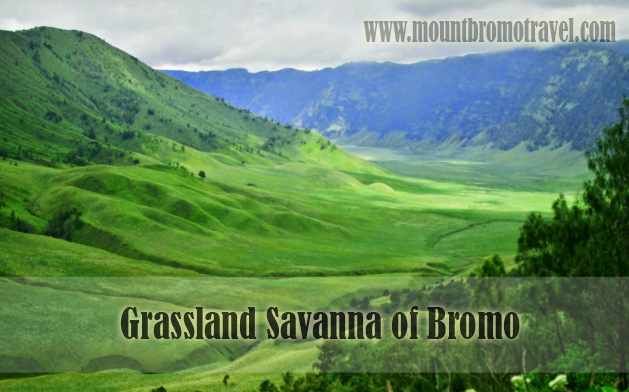 Grassland Savannah of Bromo is another spot to enjoy when you are having a tour to Mount Bromo. The grassland is spread on a large area under the foot of the mountain. The wide grassland is in the south side of Mount Bromo. If you remember about a hill in a kids’ serial entitled Teletubbies, the hill with the wide green grassland covering is like Teletubbies hill much. Grassland Savannah of Bromo is named Lembah Jemplang (or Jemplang Valley). The grassland is covered by green grasses spread widely as the width of your sight. The grassland also gives the calm, cool and comfortable atmosphere for the beautiful grassland savanna with its fresh and chilled wind blows. This grassland savanna of Bromo could become the part of your tour package to Mount Bromo. So when you book a trip to Bromo; it will not complete if you just have the sunrise viewing on the back of Bromo summit. Have another trip to increase the amazing experience of your traveling in Bromo Tengger Semeru. In addition to the grassland, you can experience enjoying the beautiful spot of the Sea of Sands; a huge land of sands that is also located surround the Mount Bromo. Having a trip to Mount Bromo is a natural adventure to enjoy the beauty of the mountain and the surrounding national park. You might feel less worthy if you only see the sunrise view from the back of the mountain. Make your trip more adventurous and memorable by spending some times on the awesome surrounding of the mountain. After the sunrise trip and get tired climbing the hill to get perfect spot of sunrise viewing, continue your trip to Bromo crater, after seeing the active volcano in east java then the trip to be continue to the grassland savanna of Bromo. To see the green grassland and the calm atmosphere, you can get rid of your tiredness there while enjoying some breakfast menu prepared from the hotel. On the huge grassland, you could see the Mount Bromo touches the valley under the foot as well as the caldera and its sea of sands as wide as 10 square kilometers. Besides the green grassland that pleases your eyes, you also can find beautiful wild flowers on some spots of the savanna. When you have Bromo Tour, don’t forget to visit the savannah as the part of your trip. 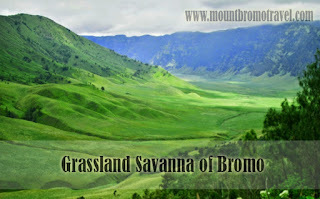 The grassland savanna of Bromo is perfect for tour with family or friends.